Our lessons are planned on an individual basis. We offer group, private and semi-private lessons. 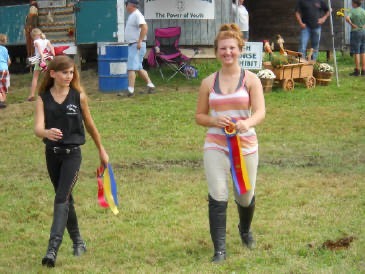 We host clinics, competitions, Pony Club (since 2009), Horsemasters, Vintage Horsepower and 4-H activities (since 1991). 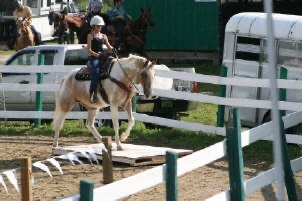 We have 4 regular instructors at Horse Amour that teach weekly, and we welcome visiting instructors frequently. 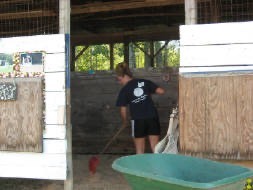 Our barn is a true learning barn, where our staff and students are dedicated to furthering our equestrian education. We are home to Horsepower, one of Rutland County's most active 4-H clubs for youth, Rutland County Pony Club, Vintage Horsepower, our adult group of horsepeople who aren't going to let all the fun be just for kids, and Horsemasters, the adult version of Pony Club. Our groups meet for clinics, recreational riding, member demonstrations, games, videos or educational topics. Visit both our Adult and Youth pages on this site. Stephanie and Sirius doing a dressage demonstration at Green Mountain College, 2014.